SIFAX Group, a multinational company with interests in Aviation, Maritime, Haulage & Logistics, Oil & Gas and Hospitality, among others, has thrown its weight behind the youth entrepreneurship and business reality TV show, The Next Titan Nigeria. The programme, which is in its fourth season, provides platform for young and creative entrepreneurs to pitch their business ideas to a panel of judges, made up of distinguished and successful business owners. The grand prize winner will go home with a car and N5 million. 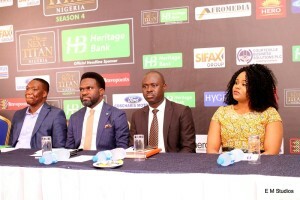 Speaking at the official kick off of the Season 4, Mr. Olumuyiwa Akande, Corporate Affairs Manager, SIFAX Group, noted that the need to reduce the unemployment rate and encourage the spirit of entrepreneurship among Nigerian youths are responsible for the financial support the company has been providing for the show since its inception. “Every serious corporate organization should be a part of what The Next Titan represents – helping our youths found their feet in bringing their business ideas to life. The rate at which young people are entering the job market on an annual basis is far higher than jobs that are created, both by the private and the public sectors. The situation is scary. Auditions for the show will hold in Lagos, Abuja, Port Harcourt and Enugu.